Why Skin Perfecting Screen SPF30 is perfect? I’m not going to get all motherly on you here but we all know we should wear SPF everyday. I don’t want premature aging and no I don’t want to damage my skin but every face SPF I’ve tried either leaves my face feeling tacky or with a white film over my skin leaving me even more pale! 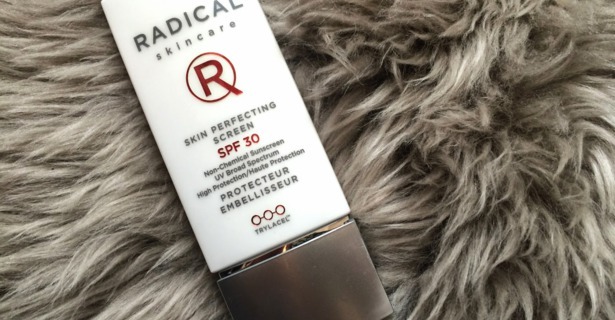 That was until I discovered the Radical Skincare Skin Perfecting Screen SPF 30. It comes out a really light purple colour which is great for correcting tired skin. It blurs lines, reduces pores and gives skin a healthy glow so it’s perfect as a base for make-up especially if you love dewy make-up. Last weekend I just wore this and a few coats of mascara and loved it. Apart from leaving the healthy glow it is undetectable on the skin and it sinks in pretty much straight away meaning you can apply make-up straight away – perfect for when you’re in a rush. A 40ml bottle will set you back £38. It may seem high but I’d happily spend that on make-up so I should be willing to spend it on protecting my skin. The way it instantly gives my skin a pick me up is like no other product I’ve tried so it will be repurchased as soon as this one runs out.